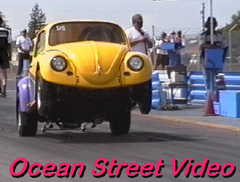 It's test and tune time at Carlsbad, in preparation for the 2001 season. Here is a look at the turbo engine Muffler Mike Sheldon built for his assault on the 11.90 Super Gas class. What's the line in Vegas for yet another class championship? Too early to tell. Shop foreman at GBE by day, family man by night, but underneath it all is an unrelenting desire to put the pedal to the metal. 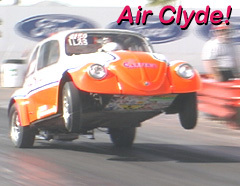 Watch as flowmaster Clyde Berg hangs three wheels in the air, then puts the hammer down hard in third gear. When the car comes down after the launch, it lands so hard that the front wheels look like they are about to break off! When the title chase is all wrapped up and there is nowhere else to go, it's time to cut loose! Here we see "Muffler" Mike Sheldon getting some major hang time, thanks in part to a turbo engine he borrowed from his buddy. Mike went on to win this Pro Eliminator season finale at Whitman, AZ. This is a 20 minute version of the telephone interview with Mark Schley, of the Schley Brothers. 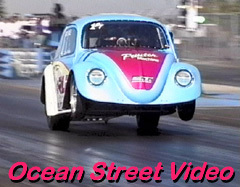 On the PRA '99 videotape, this interview runs underneath some rare home movie footage of VW drag racing that the Schley Brothers graciously allowed us to use. It appears the footage was shot around 1973 or so, and it includes Tar Babe, The Anderson Brothers, Lightening Bug, etc., racing at OCIR and other locations. 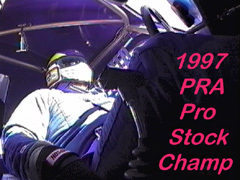 Ride along with Jack Sachette during the last race of the season as he demonstrates the driving skills that helped propel him to the Pro Stock Points Championship of 1997. This unique perspective of what it takes to cut a quick light, and then perfectly shift the car under the intense pressure of competitors who are just as fast as you are, is the essence of the heads-up Pro Stock class. Just another wheelie shot, right? Not quite! 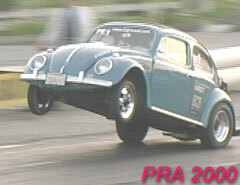 This is Pro Turbo superstar Chris Bubetz on his way to a 9.0 second pass. What's remarkable here is the distance from the body to the ground. Chris has just hit second gear, and the whole vehicle is literally jumping, not bouncing, off of the pavement. Check out the narration by chassis builder Ron Lummus! This is the aftermath of the Shawn Geers crash at Sacramento on 5/96. Shawn not only walked away from the crash, but he took what was left of the car and completely rebuilt it in time for the next race in the series. In this clip you'll see him standing on the intake manifolds to help get a better shot, but what he's really doing is covering up the secret port work! 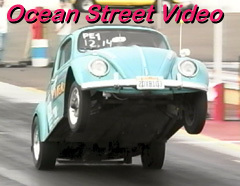 This is the original Ocean Street Video demo reel. 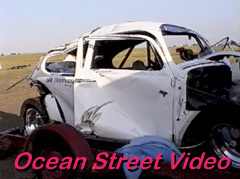 Segments include in-car camera action with Chris Bubetz in his Pro Turbo sedan, plus three wrecks, the last of which is the horrible Shawn Geers accident at Sacramento in 1996. Picture quality is excellent for the file size/clip length, but a little dark.